The effects of the housing market’s collapse can be felt far and wide, though perhaps no more so than by Latinos and other communities of color. While the overall number of foreclosure filings has recently decreased, foreclosure remains a disproportionately significant problem for these communities. The continued instability that Latinos and other communities of color face in the housing market is particularly troubling because housing and homeownership is the best way for these communities to build their wealth and assets. Prior to the housing market’s collapse in the final years of the Bush administration, Latinos were disproportionately targeted for risky subprime loans and were victims of predatory lending practices from major banks. In some cases, people of color were pushed into subprime loans by these lenders, even when their income and credit scores qualified them for a less-expensive mortgage. One study of 14 major banks found that this kind of discrimination was systematic: 30.9 percent of Hispanics and 41.5 percent of African Americans were offered these risky, expensive loans, while only 17.8 percent of whites were offered a similar mortgage. Considering that subprime mortgages can add over $100,000 in interest payments over the course of the loan repayment, these figures are especially troubling. In the wake of the housing and financial crises and the Great Recession of 2007-2009, Latinos and other communities of color continue to bear the brunt of the struggling housing market. A Latino Decisions poll revealed just how painful the housing market collapse has been for these communities. Over half of Latinos interviewed admitted to having used up all or most of their savings in order to make pricey mortgage or rent payments, and 34 percent have been forced to forego basic necessities such as food, utilities, and other bills in an attempt to make ends meet and not default on these obligations. Falling home prices only compound these problems, and approximately 31 percent of homeowners of color now find themselves “underwater,” or owing more in mortgage payments than the market value of their home, which is about eight percentage points higher than the national average. 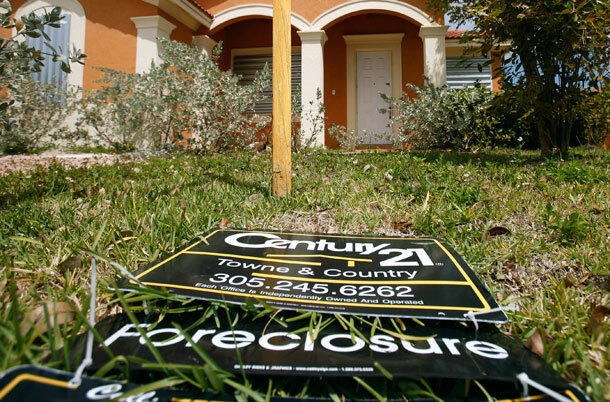 Latinos are also disproportionately plagued by foreclosure. The current foreclosure rate among Latinos is staggering. They face a foreclosure rate of 11.9 percent, significantly higher than the foreclosure rate among African Americans (9.8 percent), and appallingly higher than among whites (5 percent), according to the State of Communities of Color report. Latinos are also twice as likely as whites to be at risk of foreclosure today. Approximately 25 percent of Latinos and African Americans have been foreclosed upon or are struggling with serious delinquency, in comparison to just 12 percent of whites. Disconcertingly, these discrepancies remain when differences in income and credit rating are accounted for. The systematic inequality extends far beyond the initial foreclosure. A new study from the National Fair Housing Alliance finds that lenders and investors in home mortgages are statistically far less likely to maintain and market properties in Latino and African American neighborhoods than in neighborhoods that are predominantly white. Foreclosed-upon homes owned by these lenders and investors tend to fall into disrepair in mixed-ethnic neighborhoods at a much higher rate than in white communities. The upshot: Foreclosed homes owned by lenders or investors in Latino and African American neighborhoods are also less likely to have “for sale” signs in front of them to attract new home-owners and spur a recovery in local housing markets. The effects of this kind of neglect on the part of lenders and investors are enormous. Dilapidated properties drive down property values in the surrounding homes, increase the probability of crime and vagrancy, and can become potential health hazards as the buildings become decrepit and dangerous. The health and strength of Latino and African American communities in our nation is absolutely critical for a strong housing market and an equitable and long-lasting economic recovery. New homeownership will be one of the most important components in achieving stability and shared prosperity, and as Latinos are one of the fastest growing populations in the United States it is absolutely imperative that particular attention be paid to their housing struggles. Our economic recovery cannot ignore these most vulnerable communities, and a housing market and foreclosure system that fails to serve them is one that is destined for instability and possible failure. A recent report from the Center for American Progress outlines one of the most promising strategies to confront the ongoing foreclosure crisis: lowering the amount that the borrower actually owes on the loan, a process called “principal reduction.” Principal reduction is increasingly being recognized as one of the most effective and fiscally responsible ways to prevent unnecessary foreclosures on vulnerable populations that are at a high risk for default and foreclosure, problems that plague the Latino community. In fact, about one in four modifications on loans held by private banks include some principal reduction, according to recent data from the Office of the Comptroller of the Currency. Principal reduction is so effective because it is the only way to restore an underwater homeowner’s equity while permanently lowering monthly mortgage payments. Of course, principal reduction should not be available to everyone as a general policy, but it could very well be a viable way of aiding these communities in their recovery. Currently, as a condition of their government conservatorship, the Federal Housing Finance Agency prohibits the two largest mortgage finance companies in the nation, Fannie Mae and Freddie Mac, from utilizing principal reduction—in spite of a growing consensus that it could be extremely effective in helping communities of color, arguably the hardest hit by the housing and foreclosure crisis. Indeed, even the Federal Housing Finance Agency’s own analysis points to this conclusion. What’s more, Latinos seem to be hungry for this very kind of policy from the federal government. The same Latino Decisions poll found that Latinos are generally very supportive of the government actively pursuing and implementing solutions to the housing crisis. As our nation continues to recover from the Great Recession, greater attention must be paid to the unique challenges that Latinos and other communities of color face in the housing market and action must be taken to support these communities. Policies such as principal reduction can help to strengthen and expand the middle class, which is critical to our economic stability and shared prosperity. Jennifer Rokosa is an Ethnic Media intern with American Progress.